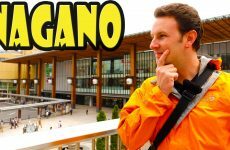 A travel guide for visiting the Jigokudani Monkey Park in Nagano Japan. Definitely a must-see attraction in Nagano, this park allows visitors to get up-close with monkeys bathing in a natural hot spring. The monkeys, known as “snow monkeys” are Japanese Macaques, and the park is located in the monkey’s natural habitat in Yamanouchi, near the onsen towns of Shibu and Yudanaka. To get to the Show Monkey Park from Nagano Station you can either take an express bus, or a train (the snow monkey train) and then a local bus for 10 minutes. 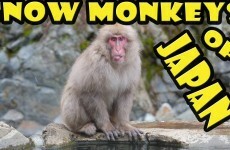 It’s then a 45 minute walk up the mountain to the Jigokudani Snow Monkey Park. Admission is 500 yen — or buy the 1-day Snow Monkey Pass which includes round-trip transportation to Nagano and admission to the Monkey Park.